Self-foaming cleanser helps clear breakouts and visibly reduces the appearance of dark marks left behind. I LOVE this brand!! 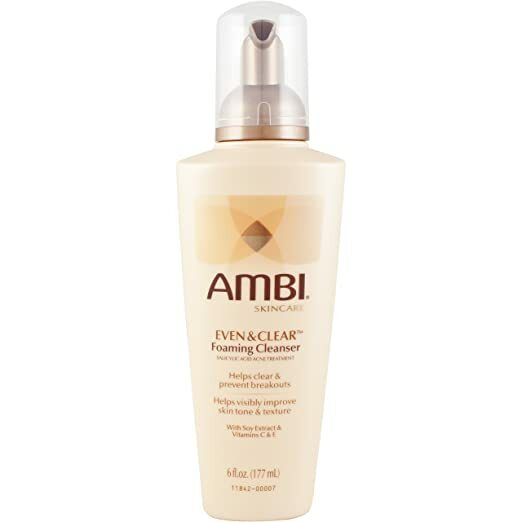 Ambi is amazing and this facial foam cleanser worked so well on my skin! It took out the dark spots on my face and leaves it feeling fresh! I highly recommend this! I AM IN LOVE WITH THIS PRODUCT IT REALLY HELPS MY SKIN WHEN I M HAVING AN OUTBREAK I REALLY RECOMMEND!! This product is literally life! I don't have oily or dry skin (it's a nice in between lol), and this product does a great job of keeping my skin moisturized. Absolutely love it!!!! I would definitely recommend! I couldnever find a face wash that worked for me until Ambi. It is now the only facial product I use. I like that it is genital on the skin and has a reasonable price. i would recommend this to all of my friends. This is the facial cleanser ice been using since I was a teenager. Helps tremendously with my acne. I will always love this product. Leaves my skin a little dry but soft and also makes me feel clean. It's a good price & I like the pump instead of squeeze so I don't use too much. I would definitely recommend this for dark spots dark circles or discoloration it definitely evens your skin tone and makes your skin look more radiant. I use this in the winter especially. It really evens skin tone and marks like it says. It doesn't strip my face either, if you haven't tried Ambi you should. This is such a great cleanser. My face always feels really healthy and clean after use. My breakouts are minimal. This is definitely a great acne fighter and not drying at all. Paired with the exfoliating wash a couple of times a week you have the perfect regimen. I also love the moisturizer to this line. It is a bit pricey, but you get what you pay for. This is literally the best stuff. Leaves my face feeling super refreshed. I've been using this stuff for over a year now & my face looks & feels amazing. Super gentle doesn't leave your face feeling all dry. This stuff is great! It's gentle enough for daily use , it's effective enough to clear and prevent breakouts and it's affordable enough for me to continue to use. I love this stuff, I actually purchased this because it was on sale and I wanted to try something new and my skin was going through a nasty breakout. I used this product for not even a whole week when my skin cleared. It is a tad bit drying so I picked up a lightweight oil free moisturizer to go along side it. This cleanser is a great product and leaves your face fresher and clean. Doesn't make me break out. Love, love, love this face cleanser. I have sensitive skin and I've never broken out using this product. You can purchase this at Walmart, Walgreens, etc for an affordable price. It is very gentle on the face! I recommend this product to people with sensitive skin! I have been using this product for years but I can't saw I have seen decreases in my dark spots on my face. I continue it because it is pretty mild and does not irritate my skin. YES!! YES!!! YES!! AND YES AGAIN!! THIS IS MY ALL TIME FAVORITE FACIAL CLEANSER OUTSIDE OF RUBBING ALCOHOL!! THIS FOAMING CLEANSER LEAVE YOUR FACE CLEAN, SMOOTH, ALL WHILE WIPING AWAY DARK SPOTS AND BLEMISHES!!! I LOVE IT!! THEY'VE WENT UP ON THE PRICE BUT I STILL BUY 2/3 AT A TIME.. I HAVE EXTREMELY OILY SKIN SO I WASH MY FACE MAYBE 3X PER DAY AND THIS HELPS ME SOOOOO MUCH!!! I have been using this product for the last several years and have had no problem with it. I like the feeling it gives me of a clean face but doesn't overly dry my skin. I was quite disappointed after using this product. It left my skin feeling tight and dry each time I washed my face. No matter how much moisturizer I applied afterward, my face was still dry and irritated. Will not be buying this product again. This self-foaming cleanser gently cleanses skin to help clear and prevent breakouts while visibly reducing the appearance of dark marks. It is specially formulated with EvenBlend™, which combines soy extract and vitamins c & e along with salicylic acid to keep skin clear and even toned. The formula is also oil-free, hypoallergenic and gentle enough for sensitive skin. Moisten face and pump cleanser into your hand or cloth. Massage lather over face. Rinse thoroughly and pat dry. If you experience dryness or irritation, use less frequently. For external use only. When using this product with other topical acne medications at the same time or immediately following use of the product, dryness or irritation of the skin may be increased. If this occurs, only one medication should be used unless directed by a doctor. Avoid contact with eyes. If contact occurs, rinse thoroughly with water.